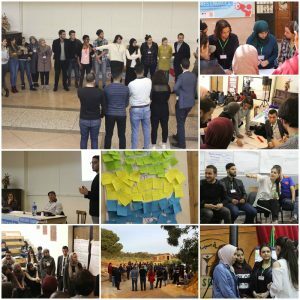 As part of the “Voix des jeunes” project organized by Graine de Paix association, in partnership with AMSED and Etoile Culturelle of Akbou, 45 young people gathered in Oran from March 10th to 15th, 2018 to take part at a Forum on the participation of young people in public life. The objective of this meeting was to bring together young Euro-Maghreb people from the cities of decentralized cooperation between Strasbourg (France), Oran (Algeria), Fez (Morocco) and Kairouan (Tunisia), to discuss, exchange and discover the participatory democracy practices in these 4 countries. Through training workshops, visits to local associations, conferences and roundtables, intercultural sub-group work and a session of sharing good practices, participants were empowered with key competences and active citizenship skills. In addition, a rally was organized by Graine de Paix association, which allowed participants to discover the history and the host city of Oran in a fun and interactive way. This activity has also strengthened group cohesion in a competitive spirit. An intercultural evening, organized in an informal setting, allowed young people to discover the organizations of each participant and to make known the culinary specialties of their regions. The Forum produced recommendations to the media, elected officials and civil society, which will lead to the relaunch of the Oran Youth Advisory Council. The project was financially supported by the PCPA Joussour program and the City of Strasbourg via the youth component of decentralized cooperation with Oran, Fès and Kairouan. We thank the project partners as well as the participating associations, especially the Espace Solidarité et Développement de Fès and Mémoire de la Medina of Kairouan for their commitment and participation.